Poster consists of black print on blue paper. 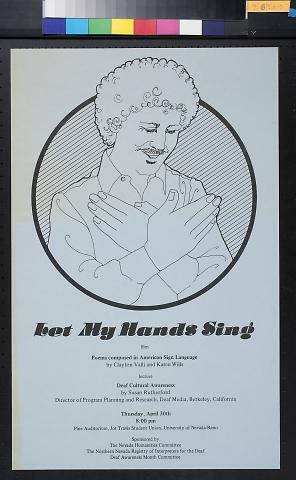 Image depicts a man in a circle with his hands crossed (similar to the American Sign Language sign for butterfly) in front of his chest. 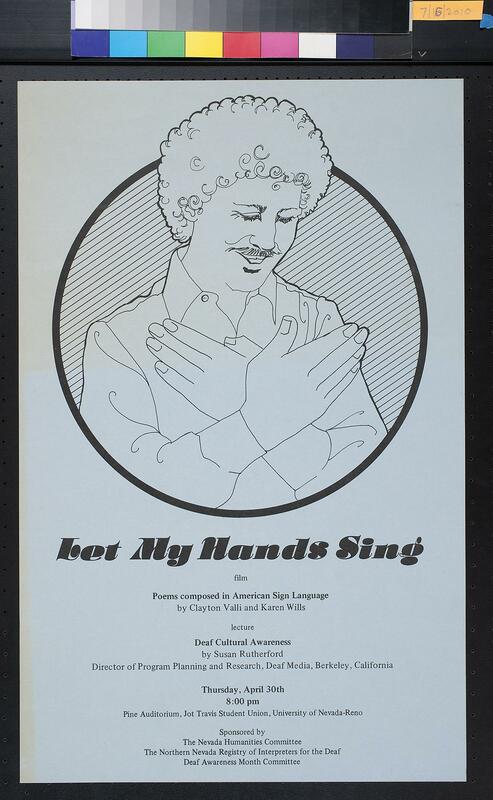 Text below includes "Let My Hands Sing / film / Poems composed in American Sign Language / by Clayton Valli and Karen Wills / lecture / Deaf Cultural Awareness / by Susan Rutherford / Director of Program Planning and Research, Deaf Media, Berkeley, California / Thursday, April 30th / 8:00pm / Pine Auditorium, Jot Travis Student Union, University of Nevada-Reno" and a short list of sponsors.